I know that in parts of the country there has been quite a bit of rain but here in East Anglia it has been very dry - in fact according to a recent item I read on the BBC website, only 28mm of rain has fallen in this part of the world for the whole of March, April and May, making it one of the driest Springs for over 100 years! 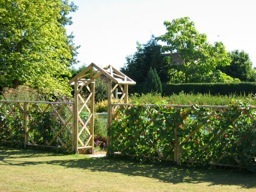 Thankfully my water butts are full from the winter rains so I will be using these to water the veg as much as possible in the coming weeks and if I have to use the hose I will do so sparingly, aiming it at the roots of each plant, rather than over the whole of the beds. Most of my vegetable plants had been growing on in the greenhouse but now that the soil has warmed up I have planted them out into the vegetable beds so they can really get established. 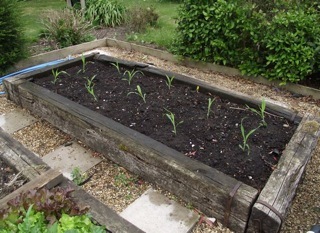 First up was my sweetcorn, which needs to be planted in blocks rather than rows to aid pollination, so I have put this in a bed on its own. 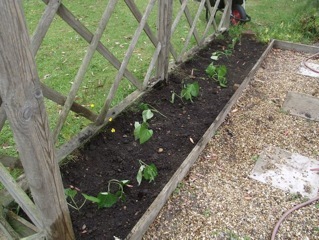 My beans and courgettes have also been planted out and, to help establish these water hungry plants, I dug a trench and put newspaper soaked in water in the bottom before planting as this will encourage the roots to go deeper and provide a good start for the plants. It’s not too late to plant out beans if you haven’t been able to start them in the greenhouse, as these can go straight into the soil at this time of year, so I have also put a bean seed in the ground next to each plant to ensure a bumper crop of runners and french beans - these are favourites in our house and you can’t beat home grown. 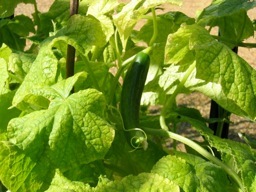 Of course planting all of these juicy young vegetable plants means that the juicy fat slugs will think dinner has certainly arrived and they can be very difficult to control, particularly at this time of year. There are different ways to deal with these revolting creatures including beer traps, copper tape and eggshells but I have to confess that I use slug pellets (the only non-organic bit of my gardening ethos) as I find these to be the most effective - there is nothing worse that taking all the trouble to grow tender young plants only to find them eaten overnight so I don’t take the chance! 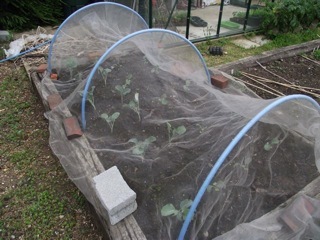 Other crops need to be covered, particularly any members of the brassica family, so my Tenderstem broccoli now has a fine mesh net over it to stop cabbage white butterflies laying their eggs and hundreds of caterpillars eating my plants before my very eyes - let’s hope that’s not the case this year! 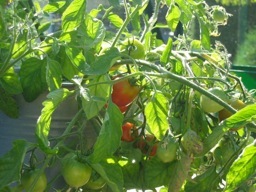 It’s full steam ahead in the greenhouse as well, with tomatoes and cucumbers planted into grow bags and canes put in to train them up when they really start to grow. 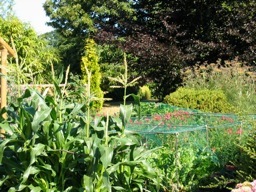 I love this time of the year as it feels like the calm before the storm - everything is starting to get established and there will be lots of lovely veg to look forward to in the coming months - that is assuming that there is enough water to go round but clever use of water butts, washing up water and even bath water should be enough to ensure the veggies flourish!